Our radiant Shop awaits... It's brimming with beautiful things. We bring artistry, fresh design and fine materials to practical accessories. So you can look your best and feel it too. Once you've experienced a Gwendolyne design you understand. Our kind of quality creates a lasting impression. We'd love to show you our latest. 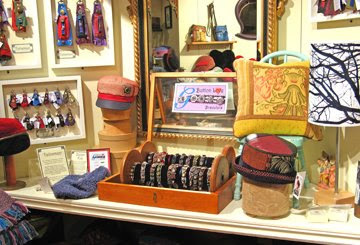 There's something for everyone at Gwendolyne Hats. We've introduced exciting new designs & a range of affordable prices to please. Make it an outing, bring friends and enjoy. 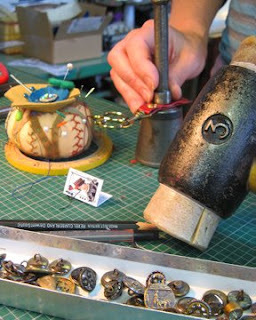 Gwendolyne makes magic in the heart of her Atelier. Sometimes her surroundings are as exciting as the finished piece. Beautiful materials inspire great things, details create character. We create modern classics you enjoy everyday. All the world's a stage. You can play the Romantic in our new Corona. Cordy cap & Boucle scarf with an autumn fringe. 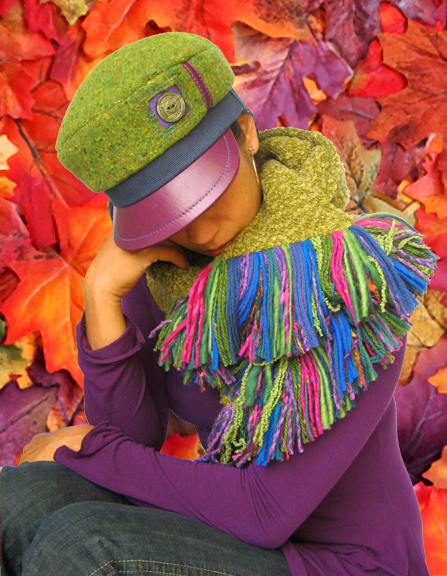 Never underestimate the benefits of a great hat and scarf. 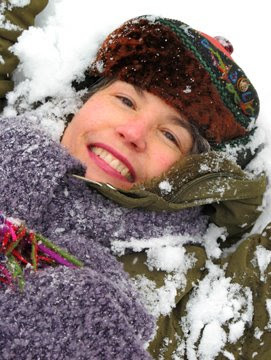 A warm smile & cozy disposition can change your day. We took this picture out on the street. I wanted to capture Toronto's vibrant urban culture. Many coloured scarves & a Mikado shoulder bag in blue. The cavalcade of colour outside our windows has been absolutely stunning. It's just so beautiful I had to get some pictures. To see my slideshow click here.You'll get the first peak at our new Amelia design, as in Earhart the aviator. Yes a new Gwendolyne hat with earflaps has arrived. Avoid the crowds. Shop with us before we go to the One of a Kind Show. 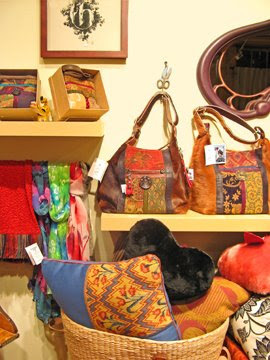 Our cozy Shop is where you'll get the most selection & personal service. Our last shopping day before the show is Friday November the 20th. The midnight oil has been burning bright in our beautiful downtown Atelier. imagery to celebrate the colours of Autumn. The Abbey Road our classic peaked cap. It was a sunny Sunday afternoon...together we created this still life with some of the tools of our trade. We wanted to illustrate how our work brings old world craft to life with a modern sensibility and style. 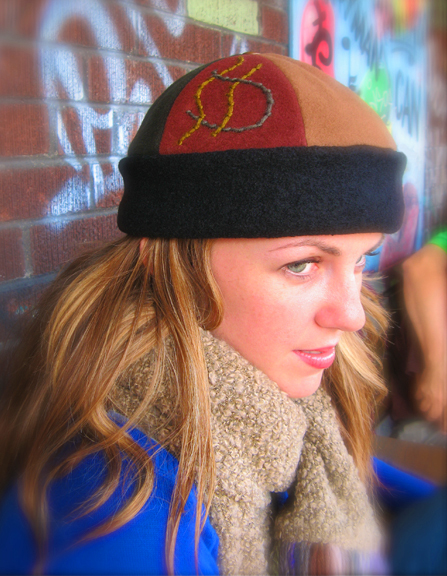 The Bean our funky wool toque. to life on camera. We got some great pictures and had a lot of fun! 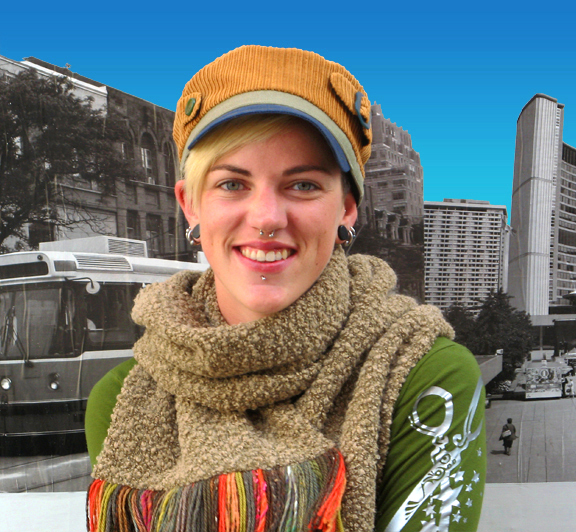 Click here to see more of our photo shoot with Dana in Toronto's Kensington Market. 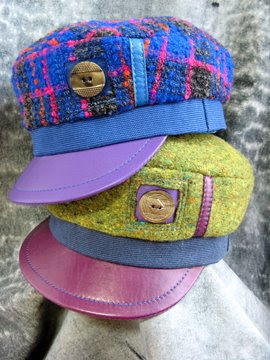 If you love Gwendolyne Hats . . .
Watch for frequent updates to our blog. We have so many exciting things to show you. You can subscribe to our posts below. Feedback is appreciated, inspire us with a comment. 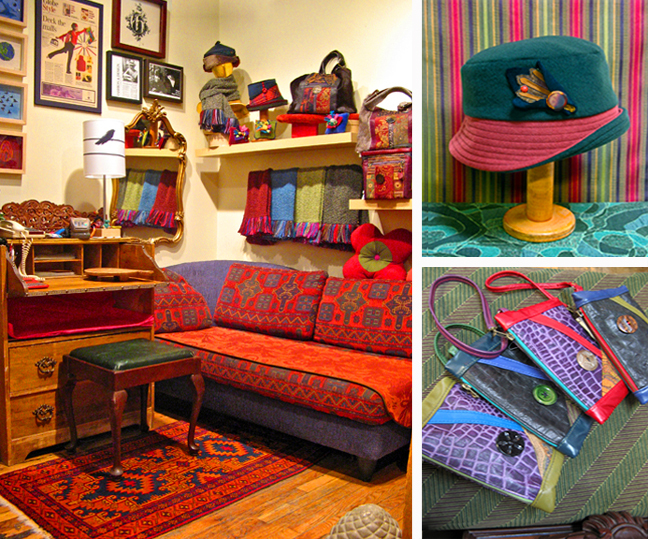 Visit our downtown Atelier where culture art and fashion meet. 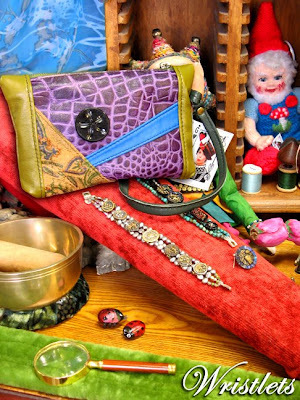 Discover a magical Shop that welcomes the creative spirit and celebrates individuality. Labels: "Abbey Road", "cool winter hats", "designer hats", "fashion hats", "gwendolyne hats", "head wear", "Kensington Market", "winter beanie hats", "winter cap"s, "winter hats", "womens's hats"
It’s been a different kind of summer this year in Toronto, elusive and uncertain. A little bit like our world today. One minute its looking good and the next minute it’s not. 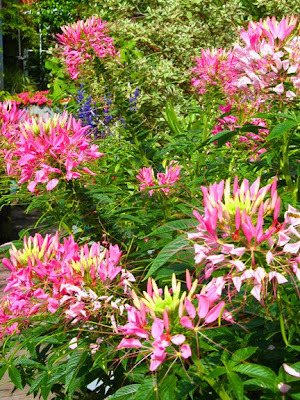 The plants have certainly flourished. Perhaps it’s because they follow a natural order. They just keep the faith, move forward with confidence and grow with the flow. I guess the lesson here is to trust your instincts and make the best of what you've got. In short live for the day and advance with optimism. 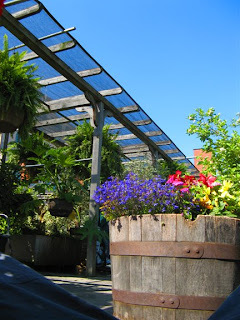 Here are some sunny Summer moments from the award winning Rooftop Garden outside our window. The first is a picture of Gwendolyne, the beautiful spirit who continues to inspire my life. 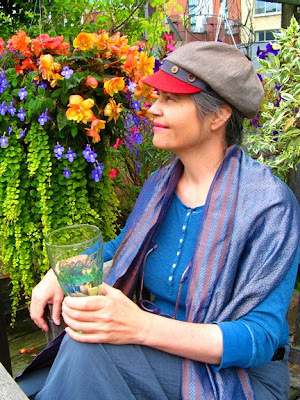 And if you're familiar with Gwendolyne Hats, chances are she’s inspired you too. Many smiling faces have passed through our doors and left with joy in their hearts. Love is the thread that connects our work together. Love is full of meaning. Everything in our Atelier is infused with a little bit of that magic. These days we've been starting work with a refreshing tête-à-tête on the Roof Garden. This peaceful oasis gets our creative juices flowing while nature's power helps to ground us. Our studio is right in the heart of the city. As we contemplate our day ahead we can feel the energy of the urban landscape around us. It's a wonderful balance. While the city feeds our mind and belly, the garden feeds our soul. 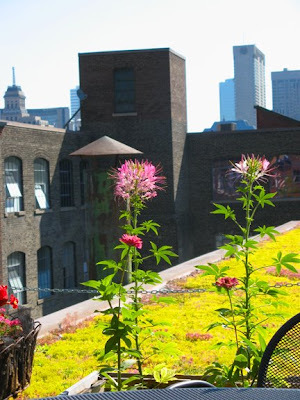 I dream of a day when the roof tops of the world are green and we all live in greater harmony with nature. Our work is a magnet for happy people. During the Summer months many travel to our city. They are always thrilled to discover this marvelous building our business calls home. Here is Lily an artist and hat lover from Vancouver who found us on her holiday. One of our greatest pleasures is meeting kindred spirits who like ourselves share their joy and spread happiness wherever they go. As luck would have it last week we got away for a holiday up north at a cottage on Horseshoe Lake. It was so refreshing to dive into the water and wash our cares away. It was a well deserved rest. We've been very busy working on some exciting new surprises for the cool seasons ahead. Vacations are relaxing but they're also a great opportunity to see life from a clear perspective. In our case it has re-confirmed our direction. Art is our calling and creativity the driving force behind our life. True to our hearts we have always made choices to follow that path. Nobody said it was going to be easy, but that's just who we are. We create the beautiful things that we think the world should see and we're proud of it. Our bottom line is quality and true value with meaning. This year you can expect our collection to be the best ever. Seize the day and get them while you can. 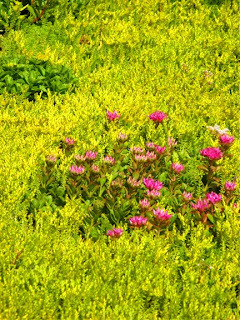 After all where would the world be without flowers. 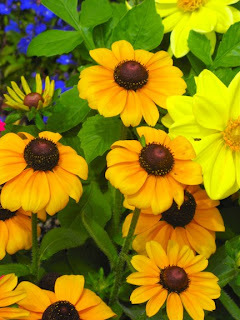 Spring in ancient times was celebrated by the gods of fertility who rose up from the under world with the keys to life. Living here in Toronto just north of the 49th parallel, our eagerness for the warm weather is heightened by a longer wait. It’s always such a magical time of year. Nature’s a powerful force that never ceases to amaze. I often remind people that our Canadian Maple Syrup is the result of our unique temperatures. That's why it tastes so sweet. Spring is the eternal optimist. She can lift your spirits; bring a skip to your step and a flutter to your heart. The desire to open ourselves to the new life ahead is everywhere we go. Here in our Atelier Gwendolyne has been busy birthing many new designs for the shop. 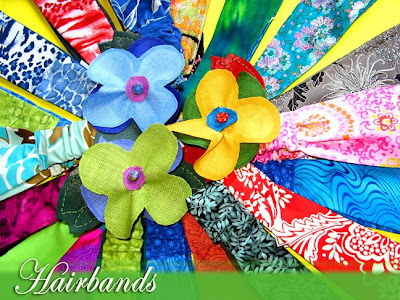 With a fresh palette of colors, her reversible Hairbands will be delighting many faces this summer. Made in all sizes, from cotton prints, these colorful bands will brighten and cool any hot summer day. This year we’ve added to our scarf collection. 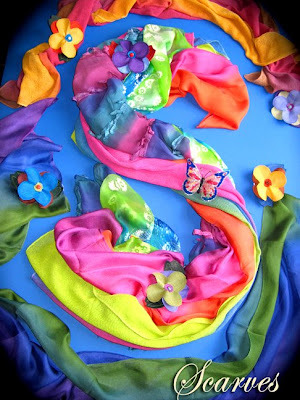 Loving silks and color, Gwendolyne has collaborated on this limited edition of exquisite shawls with an artist in Australia. Hand dyed with the themes of water, earth and fire the touch and finished edges of the silks are divine. They are perfect for the many outdoor celebrations planned in the months ahead. 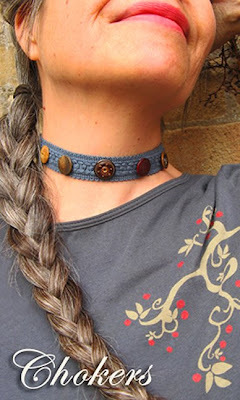 Gwendolyne's button collection has inspired a new line of chokers. Made from Japanese ribbons and braids the adjustable sizing allows great comfort. Here is one decorated with antique vegetable ivory turned buttons. The subtle details of these buttons are set off brilliantly from the background. New to the shop they are selling fast. You can ask about one to be made for you as Gwendolyne is also taking custom orders. Recently a customer dropped by and shared her daughters’ love for buttons. I think many of us have this fascination. Especially if your grandmother had jars full of them. 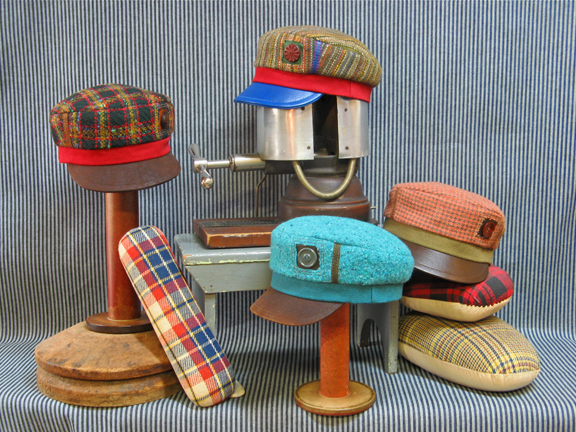 Today there are few button producers in the world that create the beautiful styles that were made in the past. The Czech Republic still produces molded glass buttons. It’s nice to see this art and craft tradition continue. It is important to celebrate the good things in our world. After all you reap what you sow. Money is a vehicle that defines our worth and values. How we circulate it is the determining factor of what we want our world to be. More then ever before we must understand what we are buying and look closely at the energy invested in it. We decide what will be created today and cherished in the future. In Gwendolyne's latest line of Button Love bracelets she has brought her cherished glass buttons from the 20's to 50's era to life on the wrist. The colors are vibrant and the base beads simple to set off the detail and color of each button. Many people love the magnetic clasp as it allows for easy closure when putting them on. We have sizes for everyone, come see them soon. I know you'll love them. 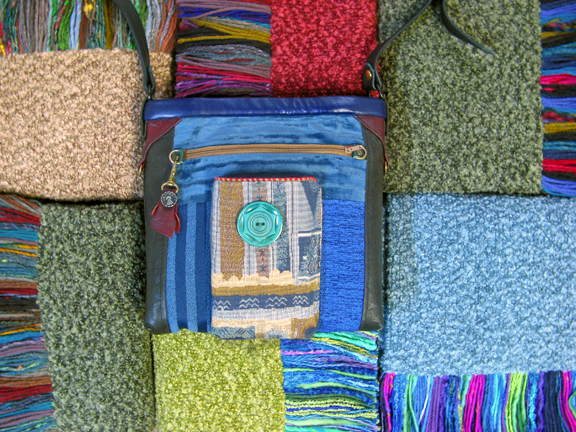 Last year many new bag designs were created and produced in our studio. Gwendolyne is always determined to bring function and beauty together. She is truly enjoying bag design, as it is both technically challenging and a perfect canvas to display her love of detail and artistry. This year she has continued her search for the perfect carry all. The Raven wristlet is designed to carry the essentials. It can be worn on the wrist or on the shoulder. I think it's all the rage these days as it allows women to carry their core goodies. Some tell me they carry it in their bigger bags during the day and later when they go out at night all they carry is their wristlet. It would certainly make it very easy to dance the night away. As always we have many beautiful hat designs for the season ahead. Come down to our shop and try one on or watch for the next blog. 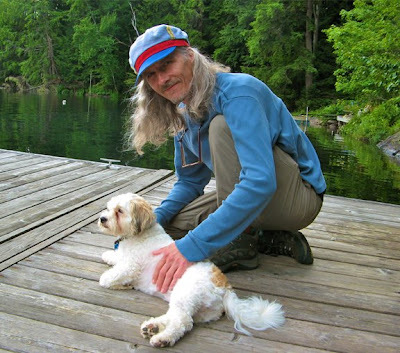 Several weeks ago we both had a wonderful bike ride down by the lake to Humber Bay Park. With the wind at our back the going was easy. On this bright Spring day many people were out walking, riding, and roller blading. Everywhere we went the birds were also enjoying the weather. The freshness in the air and the excitement that winter was over was all around us. We saw a lot of mating rituals that day. 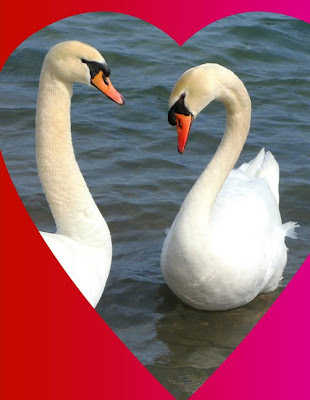 In fact these two majestic swans did their dance right before our eyes. Afterwards they leaned in for a kiss and their graceful necks formed the shape of a heart. 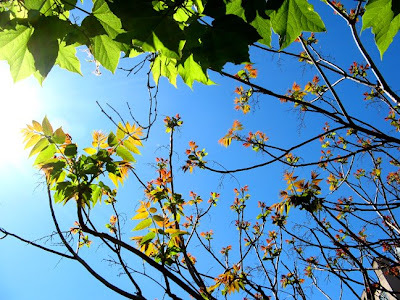 It was a beautiful moment and a reminder that Spring is a time for new beginnings and a lot of love. May the soil you till be rich and fertile. Right off the top we would like to thank everyone for making the start of our winter season such a success. Your enthusiasm was heart warming. With your valued patronage we will continue to make magic. Wow! What a fresh start for the New Year. It’s frosty white here in Toronto. Of course if you’re the proud owner of a Gwendolyne Hat it's perfect. Say hello winter baby and enjoy it every day. With the weather we’ve had lots of sightings and positive feedback. Apparently Art Eggleton was seen wearing one of our Tibetans. Is it true? I don’t know. Keep your eyes peeled; if you see others please let us know. A lot has happened since we last spoke. The end of the year is always such a busy time. Our focus going into the 2008 One of a Kind Show was tremendous. All year long we had pursued a path of growth and re-invention in a landscape of economic uncertainty. Think Positive was our daily mantra. Whatever the outcome, we were going to roll up our talents and have fun. The marketplace would decide. When the doors to the show opened something remarkable happened. People were excited to see us and they wanted what we had to offer. 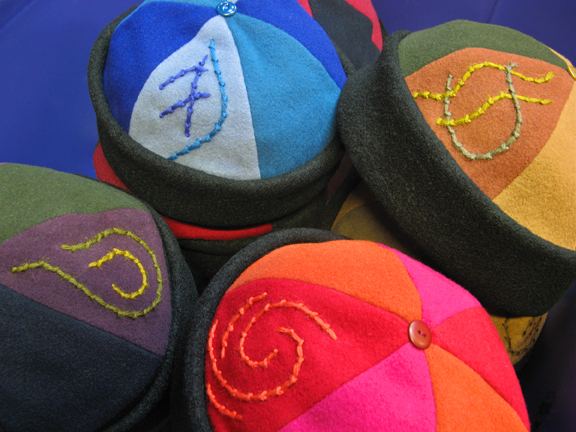 Our beautiful hats, bags, scarves, talismans and zipper fobs were all the rage. We felt blessed. Our determination to inspire both the world and ourselves had carried the day. With a new look and an upbeat attitude our booth was a magnet for happy people and smiling faces. Gwendolyne even managed to get on TV twice. First CTV Weather live with Tom Brown at the show. Then CBC Newsworld with Colleen Jones, which broadcast right across the country. After that we had a buzz in our booth and it followed us home. It's great to be back in the studio. Time to send all that positive energy forward and catch up with the demand. 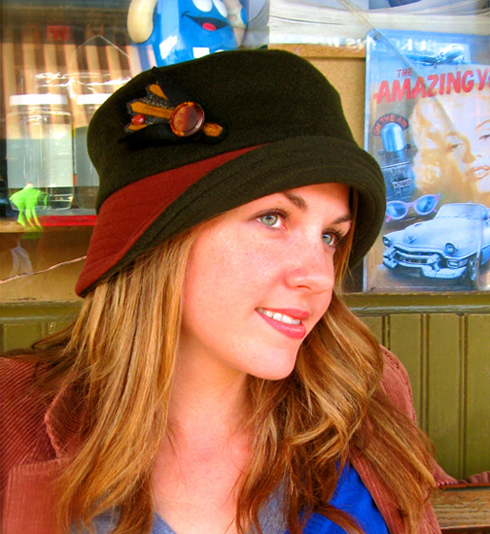 Gwendolyne's just finished a beautiful new edition of her ever-popular Abbey Road cap. You can see a couple of juicy brights from this batch above. Who knew winter could be so fun and colourful. These beauties are definitely a cure for the winter blahs. This month our cozy Atelier was filled with laughter and delight. Gwendolynes' Sunday Salons have become such a wonderful addition to our creative life. They're popular too, so we've added a Monday night. We love our studio and it feels good to share it. All you need to join us is the desire to create beautiful things with your own hands. 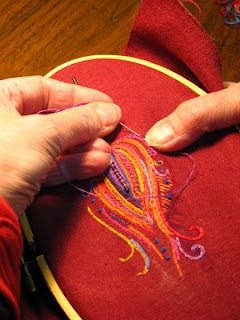 As an artist Gwendolyne has had a creative connection with the needle and thread for the better part of her life. 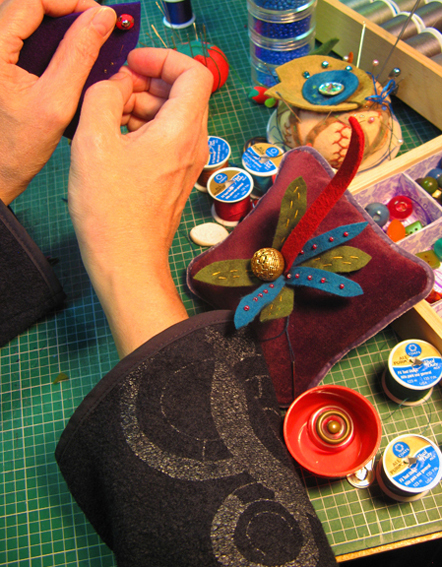 Her textile art courses are a lot of fun and encourage a community of spirit. They are a wonderful opportunity to open your mind, explore your creativity and bring more art to your life. 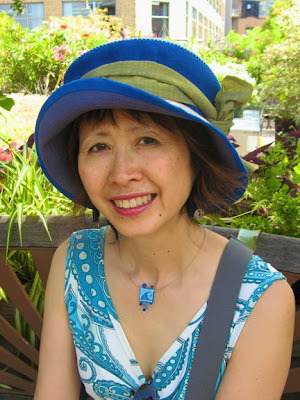 I encourage you to read further by visiting her new BLOG Atelier Gwendolyne. If you're interested in joining please click here. Here's a New Years greeting!